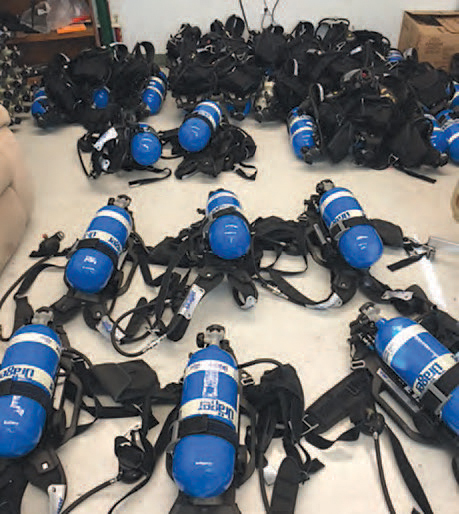 Highlandville Fire Boasts New Equipment | F.F.A.M. 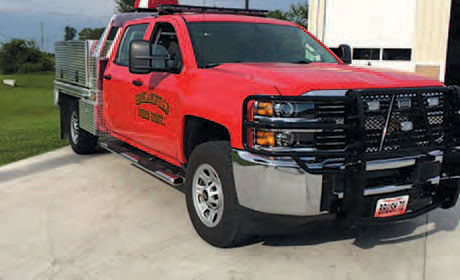 Time efficient, frugal and life-saving — those are a few of the reasons why Highlandville Rural Volunteer Fire Department recently updated its breathing apparatus and purchased a new brush truck. Both are developments Deputy Chief Adam Gilbert said were overdue and will benefit the department exponentially. The department formerly used Scott packs since its inception 20 years ago, Gilbert said. The cylinders were at the end of life, and Stephens said the department debated refurbishing the old packs or purchasing new ones. Purchasing new cylinders costs $15,000-$20,000, Chief Kevin Stephens said. The department would have to replace another set in two years and another in four. So, he said, the department decided purchasing new packs with updated, working equipment was more economical. The new Drager packs are lighter, more comfortable, adjustable and sit on a firefighter’s hips instead of hanging from his or her shoulders. The packs also reduce time when a firefighter is putting on gear. The Scott packs took about 10 seconds to put on, and the Drager packs take about seven. One of the most valuable features however, Stephens said, is that there is more oxygen in the tanks. The Scott packs were 2,200 psi, which gave a firefighter 30 minutes of air. The Drager packs provide 45 minutes, and Stephens said that 15 minutes can make a big difference and meets National Fire Protection Association requirements. Another important feature is that the packs are equipped with LED lights so if a firefighter goes down, lights and alarms go off so the individual can be quickly located. A Bluetooth mask also provides added safety and greater visibility. Thirty packs and 60 oxygen bottles were purchased through a bank loan. Stephens said the department has attempted for 10 years to get a FEMA Assistance to Firefighters grant for new air tanks, however, was denied each time. “We tried 10 years to get a FEMA grant to purchase new packs and we are finally biting the bullet,” he said. The department is still pursuing the grant, but for different projects, Gilbert said. The packs have already been used during recent car fires, and Gilbert said the department is pleased with the purchase. The new brush truck is Stephens’ pride and joy, and he put a lot of time making it the best it can be. He designed the vehicle himself and put it together with a couple other people. The old brush truck was a standard and had 100,000 miles. Stephens said it was time to update vehicles, and the new truck was designed with medical calls in mind. Often, a fire engine will respond to medical calls, but Stephens said having the brush truck will make those calls easier. “Instead of driving a $150,000 truck down the highway, now we can run a $35,000-$40,000 truck down the road,” he said. The truck was purchased through Missouri Department of Transportation’s buying agreement which allows government entities to purchase vehicles at a lower cost. The truck’s sticker price was about $40,000, and the department purchased the one-ton, single-wheel Chevrolet for $31,006. A big selling point on the Chevrolet, Stephens said, is the sharper turn radius. Stephens outfitted the back with one seat and a box fitting Drager packs and medical gear. He ordered an aluminum flatbed to help with weight, installed two boxes down each side and set a 200-gallon tank on the top. A Sparta Fire Department volunteer wired the vehicle. “Other than that, we did all the work ourselves,” Stephens said. The brush truck is based in the Stone County station and also houses the department’s Jaws of Life. Gilbert said the department hopes to purchase another brush truck in the next year, adding that the board supports the economical and operational benefits.